You can also set the flash to manual and on the XA only, set the aperture to correspond to the distance. It is worth having a flash just in case if you are indoors but flash destroys all atmosphere. Instead, use the flexipod or just prop the camera up, use the self timer and you will be astonished at the results. If there are people moving around in the picture, that's fine. If you think I am not in love with flash you are so right. 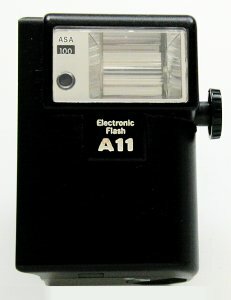 There are other flashes than the A11 but they are not common. A1L ? 7 Lithium 1.5sec ? ? 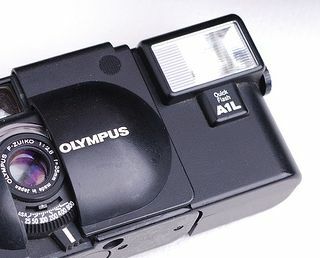 The A1L - shown below - is a low power unit designed for the XA4 for close-up work. 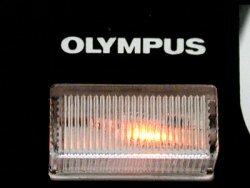 The batteries are in theory not user replaceable, but if you are handy with some small screwdrivers and perhaps some solder, you should be OK . It will fit other models we think and is highly recommended by at least one user. 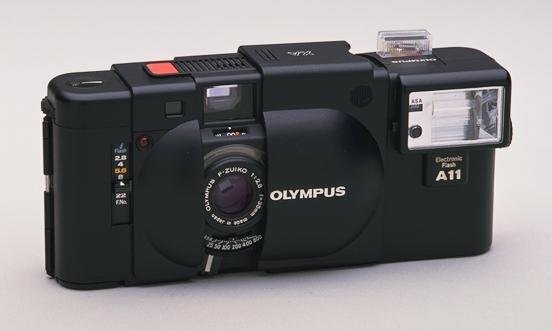 The A9M - shown below - was a cut-down version designed for the XA1 only but you can use it on any camera - but why would you? The A16 - shown below - is a 2 battery flash which is more powerful but not easily found.